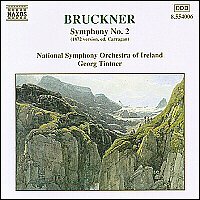 Looking afresh at Bruckner's scores has brought a whole new revelation that is quite a Nineties phenomenon. Indeed few connoisseurs will be acquainted with this massive seventy-one minute version of the Second in a new edition by William Carragan but it would be safe to say that it must be the version to have when considering an outright buy for this rather neglected symphony. The music comes through in huge monumental blocks; not in the snappy and tirade bits and pieces that characterize the Nowak version which is unquestionably more popular. Georg Tintner is obviously a conductor with a real feel for the score and I would go as far to say that along with Gunter Wand, he is the only real representative of the Bruckner school left to us. The way he shapes the mesmerizing opening of the Ziemlich schnell is amazingly romantic and the grand craggy music unfolds with magnificent splendor throughout the twenty-one minute movement. It is also refreshing to hear the National Symphony Orchestra of Ireland play with such relish and evident affection for this music, so long private property of the Vienna and Berlin orchestras. Tintner's Scherzo is also craggy and snappy and the Trio is lovingly phrased, it is in fact almost Beethovenian in its pastoral imagery. Carragan's edition pays obvious dividends in the Andante, here the movement makes much sense at eighteen minutes, in fact the construction and development of this sublime movement is a worthy prelude to the majestic edifices that permeate the last three symphonies. Mehr schnell is the Finale's marking which is also winningly done in Tintner's experienced hands, all pitfalls are negotiated with an assured sense of nobility whilst the coda is pompous and magisterial with an appropriate whipping up of intensity in the final bars. The conductor's notes are highly informative and are one of the redeeming features of what is bound to be an authoritative series as is the reproduction of a stunning view of 'Grossvendinger', the ideal companion to what is mountainous Bruckner at its finest.